This post entirely re-written by Fred, original is in small type below. Currently, all FreeEMS related projects are hosted on github, so to make regular contributions you will need to set up an account. Then the usual process is to create your own forked repo. And I merge your changes in with trunk/head when we are happy with them! Currently, FreeEMS-Tuner is hosted on github, so to make regular contributions you will need to set up an account. Then the usual process is I add you as a contributor, you get your own branch on the main repo - or create your own forked repo. And I merge your changes in with trunk/head when we are happy with them! Last edited by sry_not4sale on Mon Dec 22, 2008 9:45 pm, edited 1 time in total. right click, "git bash here"
Your identification has been saved in /c/Documents and Settings/fcooke/.ssh/id_rsa. Your public key has been saved in /c/Documents and Settings/fcooke/.ssh/id_rsa.pub. It's been up and down all arvo. Is it usually OK, I'm getting scared of putting the firmware up on it. What are the other two git services like? FreeEMS Vanilla now has a brand spanking new empty repo on github just waiting for me to sanitise the current repo HEAD and upload it all. I'm curious as to whether or not the git svn bridge brings all the history along with it? If it does I won't be doing that as it's full of stuff that I probably don't want to publish. Quench my fears of an unreliable source control service please. I had all sorts of issues with it today just because the site was yo-yo-ing. There is nothing stopping us installing git on one of your servers, and git web view and then we would have our own hosted solution. I'll checkout git web, cheers. EGit is buggy/incomplete though. It does work, but it doesn't do what I would expect it to. I made a list of things that I found wrong, some of which may be rectifiable, others may require changes to EGit. I've been meaning to put this up for some time. 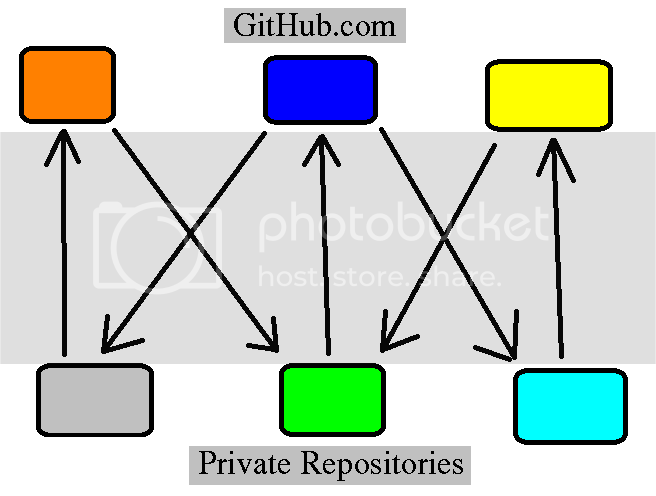 Forking with git is a bit conceptually different to working with normal version control systems. So here's my attempt at showing it in a simple light. The main FreeEMS Vanilla public repository as available on github is dark blue. My various home copies of the repository (EEE, laptop, work box, etc) are the green one. Sean's private repositories (work/home etc) are turquoise. Sean's publicly available repository is yellow. Abe's private suppositories are grey. Abe's public repository is orange. 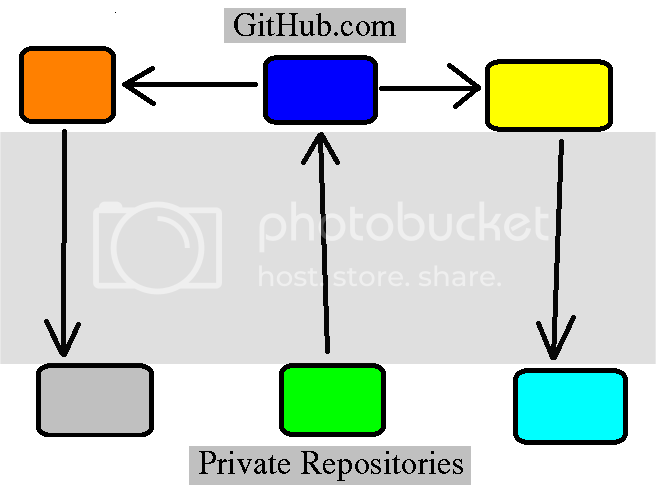 Before you can get started you need to get a public and private repository setup and working. Get a github.com account, fork my main FreeEMS Vanilla repository and set up your ssh key on there. You make changes to the code locally and when finished push them up to your public repo. You then call/email/msn/aim/gtalk/yell at me and let me know you want your stuff in the main repo. I then check out your stuff, see if it's any good and if so pull it back down to my private repo. I then merge your changes in, commit the merge and push the resulting stuff back up after testing it. This is just a conceptual guide, it doesn't explain the details in how to achieve all of these things, but the first set are more or less obvious. I'll get around to a how to achieve the above guide at some point.